Balfron’s 10k race will return this April. Calling all those looking to tackle the festive flab and get fit in the New Year – entries are now being taken for the 2015 Mulberry Bush Montessori 10k in Balfron. 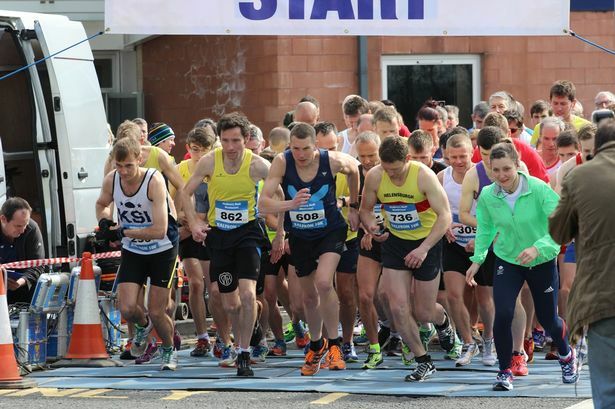 The 2015 event will take place on Sunday, April 26, and organisers are looking to build on the success of last year’s event which saw more than 600 runners – from all over central Scotland and further afield – tackle the spectacular road course in the shadow of the Campsie Hills. Race director Colin Mendham said: “We’re appealing to runners of all abilities to put the excesses of the festive season behind them and sign up for the 2015 Mulberry Bush Montessori 10k in Balfron. “There is nothing like having a race date in your diary to get you motivated and the Balfron 10k offers a rewarding challenge for everyone – from serious club runners to weekend joggers. Now in its ninth year, the Balfron 10k has been consistently voted the number one 10k in Scotland by the readers of a national running magazine. The event has so far raised over £56,000, with the funds being split between Balfron Primary School, Balfron High School and also a nominated charity. Mairi Clark, of main sponsors Mulberry Bush Montessori, said: “I am once again thrilled to be the main sponsor of the Balfron 10k. The race, which starts at Balfron Campus, follows a scenic out and back route. A chip timing device ensures a quick and accurate result for runners.